Let’s start at the beginning, shall we? 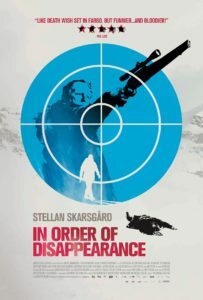 In Order of Disappearance is a film. 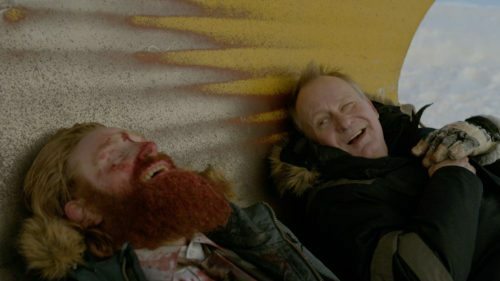 It stars Stellan Skarsgård and features a few others you may recall, including Bruno Ganz and Kristofer Hivju. I would be surprised if you recognized the director or the screenwriter, but they, too, have names. Those names are Hans Petter Moland and Kim Fupz Aakeson. Fupz, of course, being the name I wish you had, so I could call for you, loudly, across crowded rooms, you Fupz. As the film begins, there is much promise. 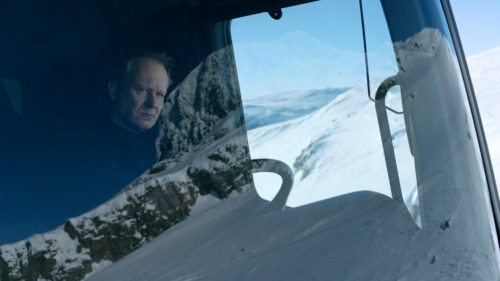 Skarsgård plays Nils, a snow plow driver in an isolated Swedish town. Nils is awarded ‘Citizen of the Year’ in a quaint ceremony and that may tell you all that you need to know about In Order of Disappearance. Still, cinematographer Philip Øgaard does some warped things with snowscapes and headlights. Style can redeem many otherwise open-and-shut stories. Here, not so much, but not for lack of trying. Nils’ son is murdered by drug dealers and made to look the victim of an overdose. Nils and his increasingly distraught wife are left with the body and a police force disinclined to investigate. This doesn’t sit well with Nils, who has a gun, a bunch of heavy snow moving equipment, and quite a bit of free time. Thus, we have our revenge film. Think less Death Wish and more an oddly low-key Shootin’ Aces. It’s an off-brand Tarantino concoction — as if someone found a tea bag Sam Peckinpah once loaned to Tony Scott and tried to get one more weak brew out of it. Does that sound harsh? It does, doesn’t it. And In Order of Disappearance doesn’t deserve a lashing. It wasn’t dreadful or incoherent or nasty, just tepid. In Order of Disappearance leans its shoulder into some dark comedy, and some of that works well enough. What doesn’t ever gel is pretty much everything else. Moland’s style involves cutting away from key events before they come to fruition, or in the midst of drama, and then returning a bit later to reveal some aftermath. Then he follows these murderous sequences with a black screen featuring a cross, or a crescent moon, or some other religious symbol and the deceased’s name(s) in the order of disappearance. But what meaning attends these deaths? What meaning attends Nils’ son’s death? What sort of journey are Moland and Aakeson taking us on? But Soderbergh was making a wry, self-depreciating joke and Moland most certainly isn’t. 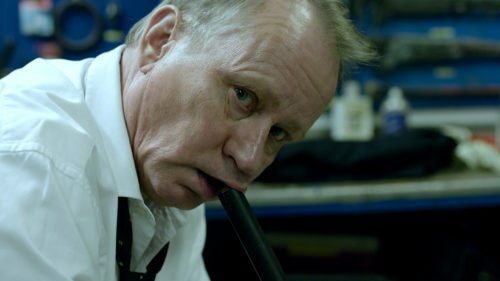 In exchange for these missing scenes and ideas, we get ‘fun.’ The film’s antagonist is a rabid, foppish drug kingpin Greven (Pål Sverre Hagen) who cannot handle his overbearing ex-wife, Marit (Birgitte Hjort Sørensen). Watching him finally punch her in the face, one assumes, is fun. Also fun, is the Southeast Asian wife of Nils’ brother (character unnamed: Huyen Huynh), who is also shrewish, mostly silent, and the type of woman to leave a funeral dragging her suitcase through ten-feet of snow towards a distant dot of a town. Ha ha! Good one. See, there’s nothing left for her now in Sweden, so she will abandon her gorgeous home, whichever friends one presumes she has, and disappear from a film that cares little for her. Maybe In the Order of Disappearance does deserve a lashing? Writing about it, my ire builds. From start to finish, the film mistakes convenience for design. Coincidence drives the plot. Drama barely raises its head. For example, Nils’ son? He’s completely innocent. The unwitting victim of a dumb friend who stashed stolen drugs in his bag. So Nils can avenge his son’s innocent death but has no struggle of responsibility; i.e. no character. In this, he mirrors the film’s other leads. Greven has no understanding of fatherhood, either, wielding his son like a token of feigned adulthood. (This, at least, seems intentional on the filmmakers’ part.) 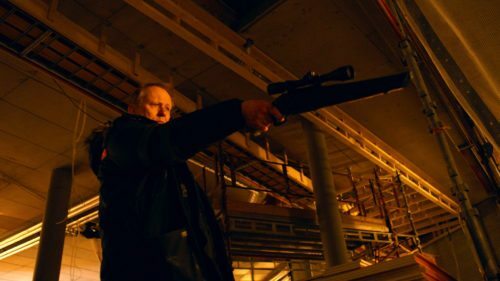 Bruno Ganz’ character — a rival Serbian drug lord known as Papa — moves through the film avenging his own son’s death, but does so in a way that eschews all responsibility for those who still rely on him. If that’s done intentionally, it is intention without clear translation. It is not, to me at least, fun. Naturally, by the film’s end, most everyone is dead. The pleasant speech Nils started us off with, about how he was proud to set a path as his town’s plow master, has led precisely nowhere. Some of In Order of Disappearance looked lovely. There were moments of incongruous, ironic humor or expressed emotion that found some footing. I suppose if you’re the sort of person who finds revenge fun, or who enjoys watching violence without most of the actual violence or any of the consequence, this could be the film for you. I think you will also probably love Suicide Squad. I watched this the other night, having forgotten you wrote about it here, when I read that the director is remaking it as an American film starring Liam Neeson called: Hard Powder. Naturally, hearing that, I had to watch the original. I liked it somewhat better than you did. Not that it was great or anything. It felt like a Norwegian making a Liam Neeson movie, with varying degrees of success. All things are the same things which are the same. Why doesn’t someone remake Stroszek with Liam Neeson and see where that gets us? They could try, but I bet he’d just shoot that chicken dead. The chicken clearly has had it coming for a long time.